This time I started out with a much larger straw wreath. I’ve read some tutorials that recommend leaving the plastic on (the straw makes a mess when you take off the plastic), but I just don’t like the idea of having plastic under everything. Instead, I take the plastic off the straw wreath while it’s in a large plastic bag. I also wrap the straw wreath with 2″ strips of old sheets (it took about 4 strips for this one) while it is still in the plastic bag. 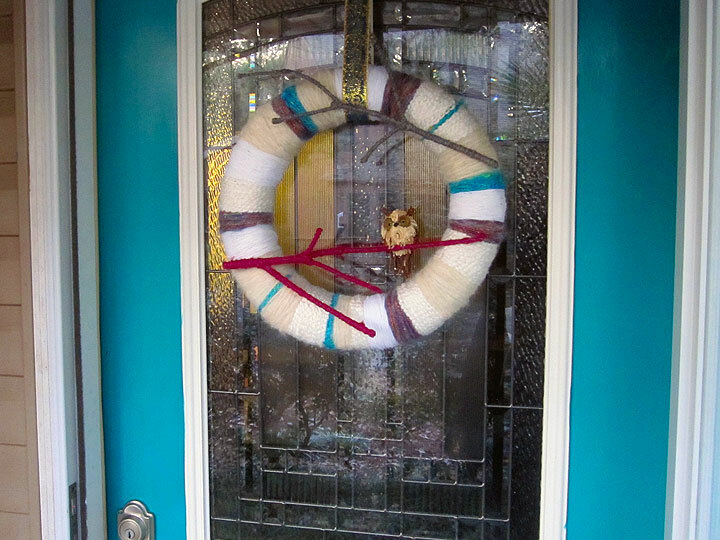 That way you have a contained mess and no plastic on your wreath. After wrapping the fabric strips all the way round your wreath, start with the yarn. 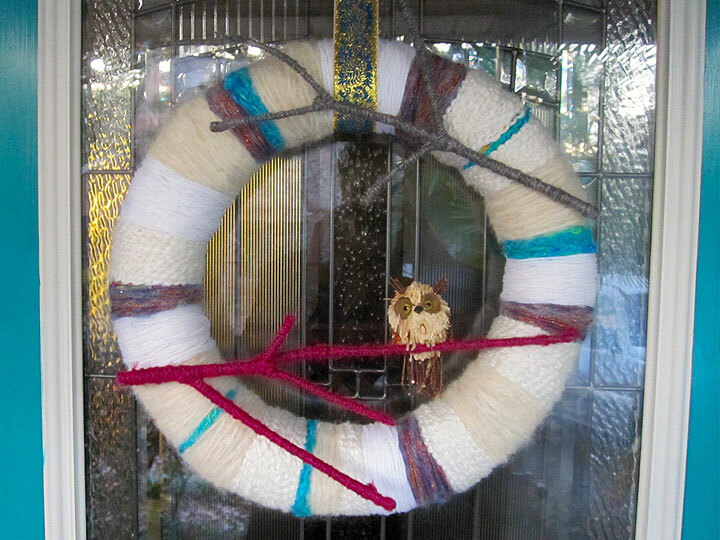 For the winter wreath, I chose 3 different textures of leftover white yarn from my stash. I also picked 3 accent yarns in colors I love – turquoise, magenta, and a mohair yarn that had lots of colors and metallics in it. I like to tie a knot it one end, put a stick pin securely through the knot, and then wrap. When I get to the end, I tie another knot and use another stick pin. The key is to make sure all the stick pins are on the back side. Also, if you plan ahead, you can use the same stick pin to secure the end of the previous yarn and the beginning of the next yarn. I don’t think there’s any wrong way to use the yarns. Just wrap them until you like what you see! For this wreath, I added a few yarn-wrapped branches from a dogwood tree that we lost in a tropical storm this fall. The branches remind me of the leafless branches of winter. My method for wrapping them was very similar. I tied a knot at one end around the branch and then wrapped; when I got to the end I tied another knot. I then used hot glue to secure a tiny tail on the back side of the branch to give the end knots some stability. I also used hot glue to attached the branches to the front of the wreath. 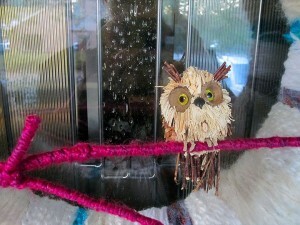 The next to last step was to add a little owl I picked up at the craft store in the fall. The branches made the perfect perch for the cute little guy. I used the ribbon remnant that I picked up on a November thrift store run to hang the wreath. Now, our house has some winter adornment AND a little friend to welcome our visitors! Love it! I also will be stealing your idea with the branch wrapping!